Horror films, traditional 80s movies from the slasher boom, to supernatural, found footage, cannibal, comedy horrors and zombie films. You know you’re in trouble when your POV killer croc title sequence is juxtaposed with the phrase, “the crocodile was created and built by _________.” Please, for the sake of whatever smidgen of suspension of disbelief we still have left, hold off until the closing credits, will ya?! Killer Crocodile’s title (if not reputation) precedes it. As you might have guessed, it’s yet another um, killer crocodile movie with the distinction being that it’s got the best Search Engine Optimized name. And delivers on its title promise. We meet an amorous couple in the tropics, the male half of whom must be some kind of magician as he gets high notes to come out of the bass string of his guitar as he gently plucks sweet nothings to his paramour. Within seconds she interrupts this intimate moment by doffing her top and charging the beach like its Normandy. She frolics about, then waves, coaxing him to join her. Next thing you know, she’s dinner. An ecologist (who resembles Greg Sestero from The Room), his lab assistant, a local guide, a photographer (and their little dog too) are paddling through a swamp that’s apparently been poisoned by the local plant. One of them dons a bio-hazard suit and jumps into the muddy river, Geiger counter in tow, apparently to see if metal barrels clearly marked “radioactive,” are indeed so. Gotta admire their due diligence. Radioactivity is the springboard, for, I don’t know…a thousand creature feature movies? And it’s a pretty good, if incredibly lazy conceit for screenwriters to fall back on. And there’s lots of speculation about why people are going missing, and washing ashore. 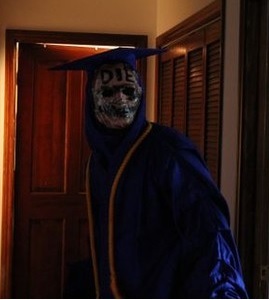 At first the carnage is mis-attributed to a boating accident, which is extremely weird unless the coroner is a graduate of the Dr. Nick Riviera School of Medicine. 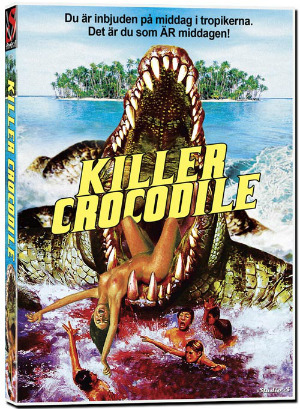 Killer Crocodile is another hilariously inept Jaws variant, this time Italian, so ergo the bonus of awkward, stilted ADR. Director “Larry Ludman” sounds suspiciously like an Alan Smithee alternative, but it’s really the pseudonym of Frabrizio De Angelis, Umberto Lenzi/Lucio Fulci collaborator, best known for the Karate Kid knock-off, Il ragazzo del kimono d’oro (The Boy with the Golden Kimono). Chomp down on this one. It’s kinda fun. And tune into our discussion on the Really Awful Movies Podcast.